Volunteers gathered on a cool Sunday morning to write down the names of 63 women, and to encourage others to pay more attention to the fates of those who are most vulnerable. Marlo Cottrell stands in the shadow of City Hall, dozens of names chalked on the stone tiles at her feet. Each name is a woman who has been killed or gone missing in Canada. Cottrell, who struggled with drug addiction and homelessness, knows her own name could have been written there. "I've watched my friends die, and their stories get lost," she said. "Because nobody cares about their lives. "Except for their families, who still have to suffer with where they are." 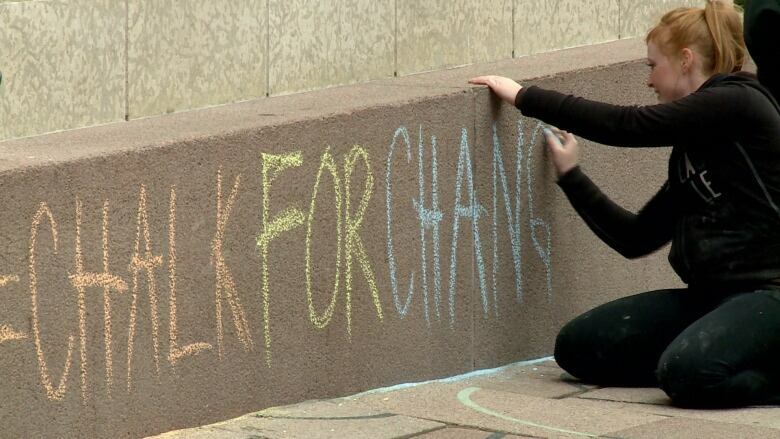 Sunday morning, about two dozen people carefully wrote out the 63 names in colourful chalk, an attempt to draw attention to violence against women. Volunteers marked down the names of more than 60 missing and murdered women on the steps of city hall Sunday morning. (Emily Fitzpatrick/CBC)Many of the cases remain unsolved. Cottrell said many of the victims were like her, living on the margins of society — easily forgotten. "I could see it in the people who worked past me," she said. "In the way I was treated when crimes were reported to the police. That I was absolutely a thing, and that I had no value. "These women are mothers, sisters, daughters. Their lives do mean something." The event, called #ChalkforChange, was born out of the frustration felt by Sharie Valentine, following the murder of another woman earlier this month. Andrea Marie Berg was found dead in an alley in central Edmonton, her feet bound and her body stuffed into a shopping cart. "It just bothered me that there was so little attention to someone who died in such a horrific way," Valentine said. Valentine was worried that Berg's death would be forgotten, along with those of other women. So, she set out with a plan to write Berg's name in chalk, along with the names of every woman she could find in Canada who was murdered or went missing in the last six months. Soon, her list grew to 63 names. Deborah Norris came to the #ChalkforChange event with Cottrell. An outreach worker in the inner-city, Norris had known Berg for years. Berg spent some time living on the streets, before she was able to move into an apartment and live independently. Norris eventually became Berg's outreach worker. "She was such a sweet, kind person. A really good, kind soul," she said. Norris said she is troubled by how little attention is paid to the deaths of people living on the street, particularly women. She said that often leads to their cases being forgotten and neglected. "Somehow, there's a kind of subtext of, 'They deserved it," Norris said. "Events like this say that no, they did not deserve it. They were good people, they were human beings." Many people do not understand how easily a person can become vulnerable, Norris said. Just a few mistakes, she said, were all it took for many of the people she worked with to fall prey to poverty and substance abuse. She argued the most effective way to prevent more people from disappearing is for society to pay closer attention to people in vulnerable situations, reversing what she calls an "us versus them" attitude. "There is just us. We're all in this together."